You will be forgiven if you’ve been perplexed by Intel’s 8th generation Core computer processors. Back in October 2017 I called this 8th-gen “a confusing Frankenstein-like monster” and that still holds true! The generation is a mishmash of microarchitectures cobbled together under a single umbrella term of “8th Generation,” and the processors have slowly trickled out over the last seven months. Now another round of processors have been announced—less than a week after the last batch. It’s a big muddled mess of CPUs with a whole new set of letters chasing the numbers that traditional define each model. So let’s try and make sense of it all. Today Intel announced a few new series of CPUs intended for laptops. All these CPUs are based on the Coffee Lake microarchitecture that was first introduced back in October 2017—this also means that there is no hardware solution for Meltdown and Spectre in these CPUs and they will come with a software patch installed. While they’re all based on Coffee Lake, all intended for mobile (laptop) devices, and all purportedly very fast, they can further be split up into three types—business, performance, and low power. Let’s start with the low-power CPUs. These CPUs are intended to be the souped up sisters of the Kaby Lake R CPUs announced way back in August. They have a higher thermal design power, or TDP, which means they won’t end up in the super slim notebooks and ultrabooks that have become popular in the last few years. (More on TDP later.) Intel didn’t announce which laptop makers would be selling laptops with these new chips, but typically, this kind of CPU would be found in something like the Apple Macbook Pro or Dell XPS 13. The new 28W U-series CPUs from Intel. These will be found in mainstream laptops. Now lets’ move onto the other two types of CPUs. They’re H-series Intel Core CPUs and the M-series Xeon CPUs. All of them have an even higher TDP than the U-series we just covered. 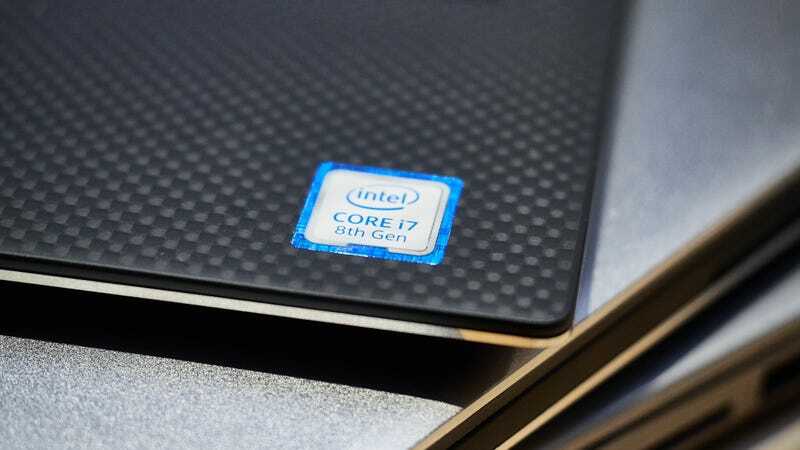 The i7, i9, and Xeon CPUs from the H-series all have 6 cores—which is a first for Intel in the mobile space (the i5 H-series are stuck with 4 cores). More cores means the chip can do more operations at the same time, which means it can get through tasks faster. The H-series CPUs are destined for slick gaming laptops and other larger (think 15-inch or more) laptops. That means you’ll likely find them in stuff like MSI and Alienware’s gaming laptops. Two of the H-series CPUs and both M-series Xeon CPUs are also outfitted with Intel’s vPro technology. Intel vPro is tech built into the CPU to allow IT departments to more easily manage devices remotely. Consequently these are likely to be found in big professional workstation laptops (15-inches or more) like Dell’s Precision line up, Lenovo’s ThinkPads, and HP’s Zbooks. The other new mobile processors. Those with vPro enabled are intended for mobile workstations while those without vPro will likely be found in gaming laptops. Intel also announced a new series of “low power” desktop CPUs today. Also based on Coffee Lake, these CPUs round out Intel’s offerings to general consumers. They’re divided into two types, the standard power 65W CPUs with no letter at the end of their names, and the new T-series 35W CPUs that will be great in home servers, network attached storage devices, and home theater PCs—as well as cheap desktop towers like you might find in your local library or office complex. What the heck is Thermal Design Power anyways? Thermal design power, or TDP, is a term that defines the thermal limit of a processor. Every CPU and GPU made has a TDP, but the number only really becomes crucial with laptops (and the occasional super intricately designed desktop). The TDP of a processor determines what kind of device it can be squeezed into. Higher TDPs mean the CPU needs more cooling and power. So a 45W processor like the i9-8950HK can’t fit into a super thin ultrabook designed for 15W processors. This is why your favorite laptop might not get an immediate refresh when a new processor microarchitecture is announced. When Intel first launched the 8th-gen it started with only 15W processors. Traditionally 15W CPUs have been reserved for super thin laptops, while 28W CPUs were found in more mainstream laptops like the Macbook Pro and Dell XPS 13. However a lot of those laptop makers have moved to 15W processors—the new Dell XPS 13 actually uses the 15W 8th-gen CPUs announced back in August. What’s up with these letters on the processors? By now you’ve seen me talking about H-series and U-series and T-series and it might feel deeply confusing. Especially because Intel does not adhere to strict rules with how it names these series—but as a rule the letter denotes two things. One: Whether the CPU overclockable. Two: the TDP requirement and whether it is mobile or for desktops. If you see the K at the end of a processor name that means it can be overclocked. That’s great if you’re a big nerd looking to pull as much performance out of your CPU as possible—and overclocking is no longer quite as risky as it once was in the days when you could fry your whole computer in the quest for higher speeds. The i9-8950HK announced today is an example of an overclockable CPU, as it the i7-8700K announced back in October 2017. Processors with K at the end tend to be for desktops only, and the i9-8950HK is the first mobile CPU in the 8th generation to have a K at the end. Unfortunately its not actually the only overclockable mobile CPU from Intel. There’s also the i7-8809G, which despite having no K on the end of the name is, in fact, overclockable. The rest of the letters found on the end of a processor’s name denote the series they’re in. U-series CPUs are for mobile and can be found in 15W and 28W variants. Intel’s first 8th-gen processors were 15W U-series processors based on Kaby Lake R. The U-series announced today are 28W and based on Coffee Lake. T-series CPUs are for desktops and found only in 35W variants. H-series CPUs were announced today and intended for mobile devices. They’re all 45W and will likely be found in gaming laptops and mobile workstations. G-series CPUs were released last week and announced at CES. They come in 65W and 100W variants and include an AMD GPU. They’ll be found primarily in workstations like the Dell XPS 15 2-in-1. Okay we’ve gotten through the what of these processors, now onto what actually matters—how fast the damn things are. They’re all based on Coffee Lake, so you can expect many of the speed improvements we’ve seen with other Coffee Lake CPUs. That means, on average, maybe a 20-percent improvement over 7th-gen CPUs with the same TDP. These new CPUs also all have support for Optane Memory, which means the read and write times on laptops could and should improve too. Unfortunately Intel didn’t provide a lot of details on how fast these chips would actually be versus the previous generation. Instead it compared the H-series chips to CPUs from three years ago and claimed an 88-percent improvement and in the case of the desktop CPUs it claimed it would be about 2.5 times faster than a five year old system. Meanwhile Intel made no notable performance claims for the 28W U-series CPUs, and it has the CPUs feeling like an odd duck, particularly as many laptop makers are moving away from 28W and embracing 15W for their flagship laptops. Which leaves us wondering what these 28W CPUs will even wind up in. So do you have any actual numbers? We do actually have some numbers—but they don’t quite provide a full view of the potential performance—just a little taste. MSI sent us the GS65 Stealth which has the i7-8750H paired with a Max-Q 1070 GPU from Nvidia inside. We also had some of the numbers from when we tested the MSI GS63VR late last year. It has a 7th-gen i7-7700HQ CPU and Nvidia 1070 GPU. In Civilization VI the MSI GS65 Stealth only rendered frames about 1 millisecond faster—hardly an improvement. But in Rise of the Tomb Raider tested on 1080p on High it managed 93.9 frames per second—a full 13 fps faster than the GS63VR. It also creamed the older laptop, which only came out late last year, in the synthetic benchmark Geekbench 4 too. There is had a single core score (which scores the performance of a single core on the CPU) of 5041 versus the GS63VR’s score of 4250, and thanks to two additional cores it creamed the GS63VR’s multicore score. That was 18031 versus 12850. That suggests that the improvements are nice, but not extreme enough to warrant upgrading a computer purchased in the last year. When can I actually get something with these CPUs? Laptops with the new H and U series will start shipping this month, and Acer, MSI, HP, and Asus have all promised H-series gaming machines soon. The desktop processors start shipping today.